Photo measuring approx 4.75 x 7.5 inches, affixed to a cardboard backing that appears to have been a part of a larger frame/folder. I’ve got nothing in particular to say about this one except that I think it’s very pretty. Uncharacteristically struck dumb? 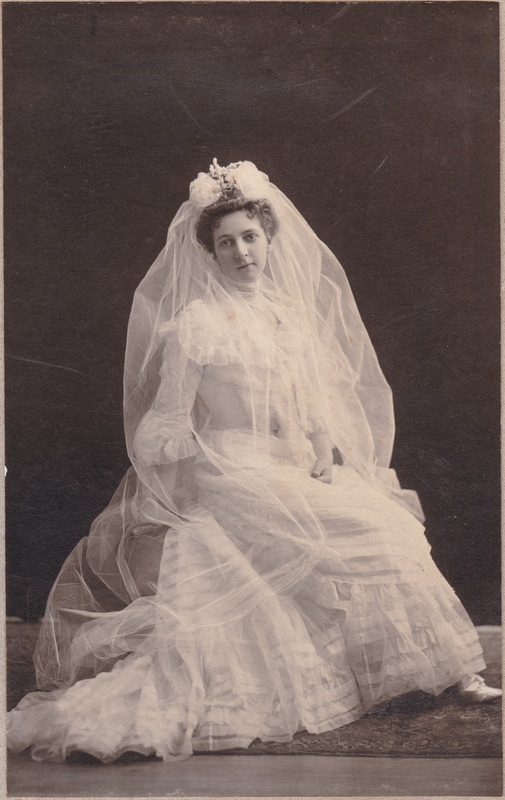 I can add that, from recent costume research, transparent gowns like this (you can see through to a ruffled petticoat at the hem) were known as “lingerie dresses.” Despite the name, they were regularly worn by proper ladies. They were popular in the Edwardian era–this one looks to be from the first years of the 20th century (or maybe the tail end of the 19th); the ones in the teens are narrower in cut. LOL, or just tired. Thanks for all the info!